Birds, Steve Martin, and BC scenery: it's a go! I'd been looking forward to The Big Year, a movie based on a book of the same title by Mark Obasmick, and starring Steve Martin, for close to a year. 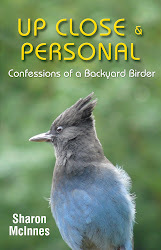 I had read and thoroughly enjoyed the book, a humorous tale of three wildly competitive birders obsessed with winning a 'big year'. What's a 'big year'? Basically it's a year (Jan 1 - Dec 31) spent travelling all over a continent hunting for as many species of birds as you can find - and keeping track. The goal is to see or hear more species than any other 'big year' competitor. Obasmick's book chronicles the true story of three men who competed in the 1998 Big Year in North America - which has over 700 different species, many of which inhabit one particular region or coast. Birders (with money!) have been known to hop on a plane at a moment's notice ('hot lines' play a role here) in order to see a specific bird on the other side of the continent. And to traipse through sleet and snow seeking an elusive species; and to get up in the middle of the night to track down a particular rare owl; and to stand around a garbage dump for hours waiting for the next 'missing bird'. Not my cup of tea. But it was a lot of fun to read about. When I learned that The Big Year was being shot in BC I was even more eager to see it. It opened about two weeks ago in Vancouver, and it happened that (as luck would have it) I was going to be in Vancouver the following week. Yes!! But my excitement was short-lived as reviews started showing up in the bird blogs. A lot of birders were not impressed. There were, of course, the inevitable complaints about ornithiological inaccuracies. And criticisms of Fox Studios for their lack of support for 'the birding community'. But many said it was just a dud, in spite of the subject matter. Nevertheless I went. And took my friend Mary (who is definitely not a birder) with me - after warning her about the reviews. She said she'd already heard from friends who'd seen it that, in spite of Steve Martin, the movie wasn't worth seeing in a theatre. ("Wait for the video, if you must see it" seemed to be the consensus.) Still, off we went! I thoroughly enjoyed it. To all the people who said it wasn't funny, I can only shake my head. I thought it was hilarious. Maybe that's because I could identify just a little with the wacky things obsessed birders do. But it was more than funny. The relationship between one of the birders and his father was touching. And I liked that there was, in Mary's words, a "villain" - the guy who "wins" also loses. And of course, there were a lot of birds! Yes, some of them, apparently, were computer-generated images. But I couldn't tell. And really I don't care. No, it won't win an Academy Award. Or any awards. Yes, it had a lot of cliche moments. This is not a movie for intellectuals or film buffs. But it is, in my opinion, worth seeing - and even on the big screen. And my non-birder friend, Mary, thinks so too. It's playing in Nanaimo now. If you see it, I'd love to know what you thought. Someone asked me yesterday how to tell the difference between our common rufous hummers (which arrive in March to breed and stay for the summer) and an Anna's. Other than the sure-fire solution - if it's here now it's an Anna's! - you can tell by its colouring. 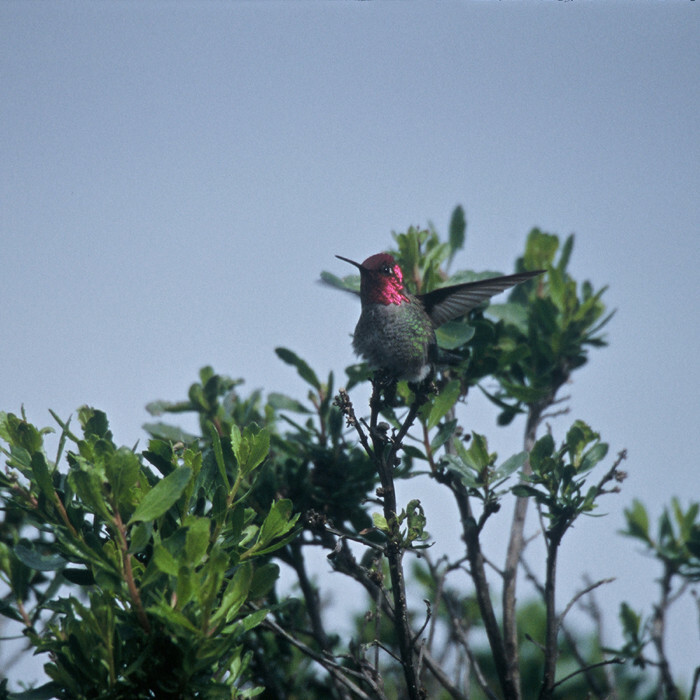 The male Anna's has an iridescent rose red bib covering its head and throat, and an emerald green back. There is no rufous (brownish) colouring anywhere. The female Anna's has a small rose red throat patch only and a green head. Again, no rufous colouring anywhere. Both have a partial white eye ring. The Anna's female now visiting the fuschia in our backyard (and our feeder, from time to time) seems a little longer (taller?) than the rufous hummers we're used to seeing. Are you feeding Anna's this winter? Feeding the Anna's in winter is a more serious responsibility than feeding the rufous in the spring and summer when natural food sources are plentiful. When the temperature falls close to freezing, be sure to bring your feeder in after dark (so that it doesn't freeze then crack, and to warm up the nectar a little) and put it back out early in the morning for the Anna's to breakfast on. (Anna's also feed on small insects and spiders when they're available.) And be sure to keep your feeder clean - as always. *Photo courtesy US Fish & Wildlife Service. Thank you.